CLICK BELOW TO HEAR KEITH NAFTALY ON SUMMER JAM. PHOTOS FROM SUMMER JAM 87-90. 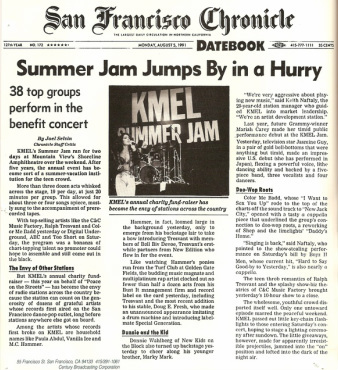 CLICK BELOW TO HEAR A PROMO FOR SUMMER JAM '87. CLICK BELOW TO HEAR A PROMO FOR SUMMER JAM '88. CLICK BELOW TO HEAR A PROMO FOR SUMMER JAM '89. CLICK BELOW TO HEAR A VIGNETTE FROM SUMMER JAM '89. CLICK BELOW TO HEAR A VIGNETTE FROM SUMMER JAM '90. PHOTOS FROM SUMMER JAM 91. CLICK BELOW TO HEAR A PROMO FOR SUMMER JAM '91. CLICK BELOW TO HEAR A VIGNETTE FROM SUMMER JAM '91. PHOTOS FROM SUMMER JAM 92. CLICK BELOW TO HEAR A PROMO FOR SUMMER JAM '92. CLICK BELOW TO HEAR A VIGNETTE FROM SUMMER JAM '92.